The Battle of Drewry’s Bluff, also known as the Battle of Fort Darling or Fort Drewry, took place on May 15, 1862, in Chesterfield County, Virginia, as part of the Peninsula Campaign of the American Civil War. Five U.S. Navy gunboats, including the ironclads USS Monitor and USS Galena, steamed up the James River to test the defenses of Richmond, Virginia, the Confederate capital. They encountered submerged obstacles and deadly accurate fire from the batteries at Drewry's Bluff, which inflicted severe damage on Galena. The Federal Navy was turned back. In the spring of 1862, Union Maj. Gen. George B. McClellan launched an amphibious operation against Richmond by landing troops at Fort Monroe and then marching northwest up the Virginia Peninsula. After the fall of Yorktown and the withdrawal of General Joseph E. Johnston's army up the Peninsula, only the Confederate Navy ironclad CSS Virginia prevented Union occupation of the lower James River and Norfolk. 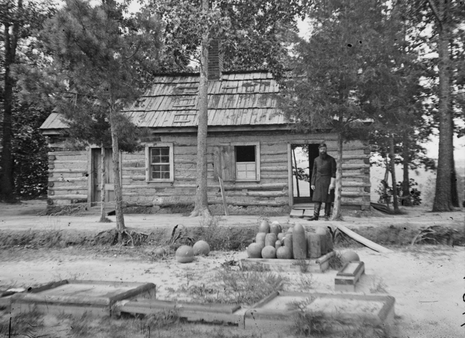 When the Confederate garrison at Norfolk was evacuated by Maj. Gen. Benjamin Huger on May 10, 1862, Flag Officer Josiah Tattnall knew that he could not navigate Virginia through the shallow stretches of the James River toward Richmond, so she was scuttled on May 11 off Craney Island to prevent her capture. This opened the James River at Hampton Roads to Federal gunboats. The only obstacle that protected Richmond from a river approach was Fort Darling on Drewry's Bluff, overlooking a sharp bend on the river 7 miles down river from the city. The Confederate defenders, including marines, sailors, and soldiers, were supervised by Navy Cmdr. Ebenezer Farrand and by Army Captain Augustus H. Drewry (the owner of the property that bore his name) of the Southside Heavy Artillery.The eight cannons in the fort, including field artillery pieces and five naval guns, some salvaged from the Virginia, commanded the river for miles in both directions. Guns from the CSS Patrick Henry, including an 8-inch smoothbore, were just upriver and sharpshooters gathered on the river banks. An underwater obstruction of sunken steamers, pilings, debris, and other vessels connected by chains was placed just below the bluff, making it difficult for vessels to maneuver in the narrow river. On May 15, a detachment of the U.S. Navy's North Atlantic Blockading Squadron, under the command Cmdr. John Rodgers steamed up the James River from Fort Monroe to test the Richmond defenses. The flotilla consisted of the ironclad gunboats USS Monitor (commanded by Lt. William N. Jeffers) and USS Galena (the flagship), the screw gunship USS Aroostook, the side-wheeler USS Port Royal, and the twin-screw ironclad USS Naugatuck. At 7:45 a.m., Galena closed to within 600 yards of the fort and anchored, but before Rodgers could open fire, two Confederate rounds pierced the lightly armored vessel. The battle lasted over three hours and during that time, Galena remained almost stationary and took 45 hits. Her crew reported casualties of 14 dead or mortally wounded and 10 injured. Monitor was a frequent target, but her heavier armor withstood the blows. Unfortunately for her crew, her guns could not elevate high enough to fire on the Confederate batteries, 110 feet above the river. Naugatuck withdrew when her 100-pounder Parrott rifle exploded. The two wooden gunboats remained safely out of range of the big guns, but the captain of Port Royal was wounded by a sharpshooter. Around 11 a.m., the Union ships withdrew to City Point. The massive fort on Drewry's Bluff had blunted the Union advance just 7 miles short of the Confederate capital, at a loss of 7 Confederates killed and 8 wounded. Richmond remained safe. Rodgers reported to McClellan that it was feasible for the Navy to land troops as close as 10 miles from Richmond, but the Union Army never took advantage of this observation. 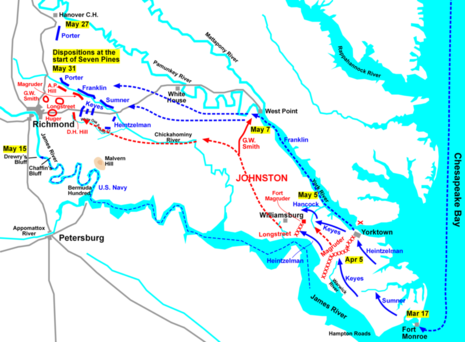 The area saw action again during the Siege of Petersburg in 1864-65. During the battle, Corporal John F. Mackie became the first Marine to earn the Medal of Honor. With the fall of Yorktown, the Confederate ironclad Virginia at Norfolk was scuttled to prevent her capture. This opened the James River to Federal gunboats. On May 15, five gunboats, including the ironclads Monitor and Galena, steamed up the James to test the Richmond defenses. 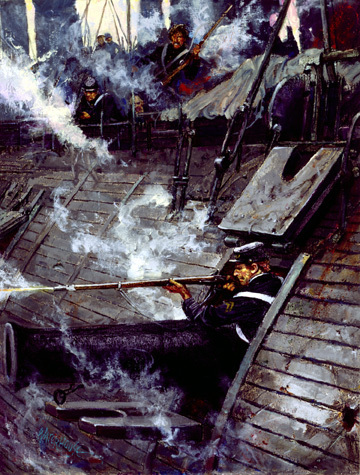 They encountered submerged obstacles and deadly accurate fire from the batteries at Drewry’s Bluff, which inflicted severe damage on the Galena. The Federal Navy was turned back.